This is one of my favourite desserts to bake because it makes the entire house smell amazing. This is not only a dessert, but also a delicious snack, or breakfast with a cold glass of milk. 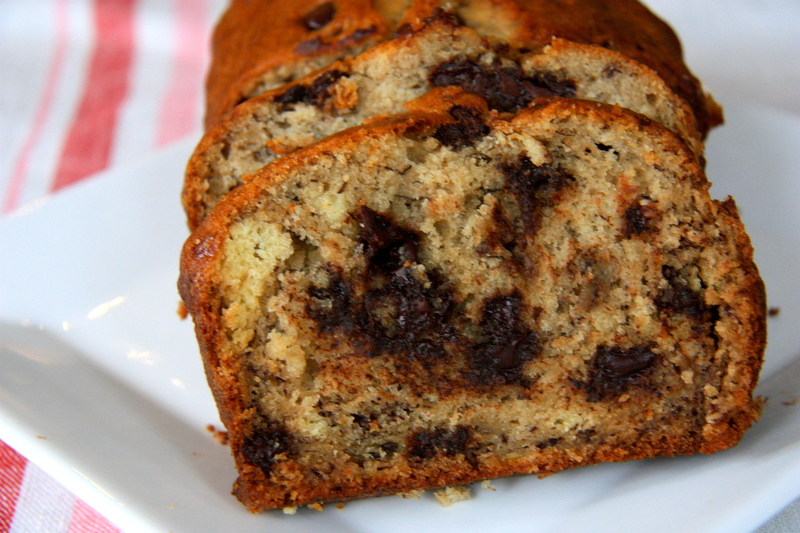 Most banana breads use a whole cup of sugar and sour cream. This recipe is on the lighter side because it uses buttermilk to replace the sour cream, which makes it less fattening. Ripe bananas are naturally very sweet so you do not need a lot of sugar. Chocolate chips make it irresistible! Preheat oven to 350 F. Grease a 9 by 5 by 3-inch loaf pan with the reserved teaspoon of butter. In an electric mixer with the paddle attachment, combine the remaining butter and sugar. One at a time add the eggs and beat until combined. Add the banana, buttermilk, and vanilla to the butter egg mixture and mix until smooth (a few lumps of banana are ok). Whisk the flour, salt, and baking soda together in a bowl. Add to the liquid mixture and combine just until moistened (Do not over mix). Using a spatula, fold in the chocolate chips. Pour the batter into the greased pan and bake for 1 hour, or until a toothpick inserted comes out clean. Remove from oven and cool for a half hour then remove loaf from pan. Slice and enjoy! If you are looking for a healthier filling, try opting for walnuts or pecans instead of chocolate chips.